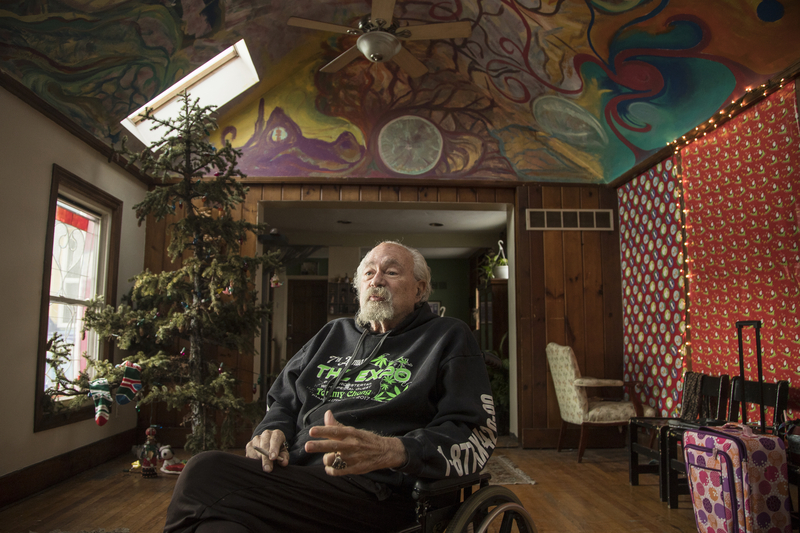 DETROIT — Despite being a self-described mess, the aging and more mellow John Sinclair is taking a victory lap. Arguably, the man most responsible for starting the movement to legalize marijuana in the United States, Sinclair is quietly celebrating Michigan’s vote to free the weed by repeating a daily ritual — lighting up a joint or two, but now happily doing so without the fear of being arrested. Sinclair said he hopes opening the John Sinclair Foundation Cafe and Coffee Shop in Detroit will resurrect the hippie hangout days full of art, music and poetry that he remembers so fondly. He’s given up the radical notions that led him to start the White Panther Party to support the ideology of the Black Panthers with the ultimate goal of changing a capitalist society. That activism led to too much attention from law enforcement and he racked up three marijuana-related arrests and ended up landing a 10-year prison sentence for giving an undercover police officer two joints. After serving more than two years of the sentence — with time in both Marquette and Jackson correctional facilities — Sinclair was let out a few days after a “John Sinclair Freedom Rally” in 1971 in Ann Arbor that featured rock luminaries John Lennon and Yoko Ono, Bob Seger and Stevie Wonder, poet Allen Ginsberg and radical activists Abbie Hoffman and Bobby Seale. The Michigan Supreme Court ruled that the sentence was unduly harsh and he was released from prison and his conviction was ultimately overturned. But he never gave up weed, and started several organizations that advocated for legalization. A few months after he was released from prison, Sinclair was instrumental in getting the first Hash Bash — an annual, very public and smoky celebration of all things marijuana — off the ground on the Diag at the University of Michigan campus in Ann Arbor. Time has not been kind to Sinclair, however. He’s traveled the world, living in Ann Arbor and New Orleans and now splits his time between Amsterdam, where marijuana is plentiful, and Detroit. But his health is failing and after a few falls, the 77-year-old now uses a wheelchair and calls the Detroit Medical Center his second home. “I’m a mess,” he acknowledged. But not enough of a wreck to give up his passions: a weekly radio show, promotion of artists, musicians and poets and the ability to get high. And he hopes that will continue at the coffee shop, which will be housed in the appropriately named Dr. Bob’s Psychedelic Healing Shack, a brightly painted doctor’s office, cafe and gathering spot for hippies, hipsters and anybody who’s looking for a place to “relax.” He’ll record his radio show on Monday nights, feature blues’ musicians on Tuesday, Wednesday and Thursday nights and host poetry readings on Sundays. There will be no marijuana for sale at the coffee shop and even smoking in a public place remains in a legal gray area. But on a recent Wednesday afternoon, Sinclair casually smoked a joint at the gathering spot and dreamed about what is to come. Although Michigan’s new marijuana law prohibits public consumption of pot, it also allows communities to designate spots for cannabis consumption at businesses that aren’t accessible to people under the age of 21. Sinclair hopes that his coffee shop will become one of those officially designated spots. And while he’s happy with the ballot proposal victory — it passed by a 56-44 percent margin — he’s disturbed by the maze of rules, regulations and expenses that are going along with the budding marijuana industry. And now that Michigan voters have had their say, joining nine other states that have legalized marijuana for adult recreational use, Sinclair expects the federal government will jump on board too within the next few years. And while he’s glad to have played a part with taking marijuana mainstream, he hopes widespread acceptance and legalization happens in his lifetime.